Back in June of 2017 we reviewed the Mercedes-Benz AMG GLC 43 Coupe. Like many of the AMG’s we test, it’s hard not to like how crazy they are. But they are not perfect, far from it. AMG models from Mercedes-Benz usually combine extreme luxury and excess performance and are usually much more about the want than the need. The AMG 43 we reviewed hit all of these points around the 8.5 of the madness scale. A 10 on this scale is usually left for the models that bear the badge numbers 63 beside AMG, and this can be pushed to 11 for those with AMG 63 S.
The Mercedes-Benz GLC SUV starts with two shape variants. 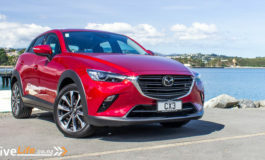 Your more typical SUV with a square rear end, and the Coupe – sloped or fastback model. They designate the difference by GLC SUV, and the sloped back is the GLC Coupe. Within the lineup you have 4 models; two petrol and two diesel. It begins with the GLC 200 which starts at $82,900 for the SUV and no coupe option available. Next is the GLC 250 which starts at $96,900 for the SUV and $106,900 for the coupe. Then we have a diesel option, the GLC 250d which is $98,900 for the SUV and $108,900 for the coupe. The AMG 43, which begins at $120,500 for the SUV and $126,300 for the coupe. And last but not least is the AMG 63 S which begins at $184,900 and the coupe at $189,900. The GLC is available in 10 colors, two of which are standard: Black Non-Metallic and Polar White Non-Metallic. Every other paint option however, comes with an additional cost. Obsidian Black Metallic, Iridium Silver Metallic, Cavansite Blue Metallic, Brilliant Blue Metallic, Diamond Silver Metallic and Selenite Grey Metallic are all $990 extra. And designo Diamond White BRIGHT Metallic and designo Hyacinth Red Metallic are $1,990 extra. Add to this the interior trim inlays options, of which there are 5: black ash open-pore wood, black piano-lacquer look – light longitudinal aluminium trim, dark brown line structure high-gloss Wood (Only available as part of designo Package $5590) and light brown high-gloss lime wood which are standard. The AMG Carbon fibre/longitudinal aluminium trim is $1,490 extra. The standard equipment for the GLC range is impressive and would take up an entire page to list. So I will just say that the AMG 63 has everything the all the other models have, plus the following options as standard: AMG Performance seats, AMG Performance steering wheel in Nappa leather / DINAMICA microfiber, THERMOTRONIC automatic climate control, AIR-BALANCE package, AMG instrument cluster with AMG main menu and RACE TIMER. And for the exterior, you get the AMG Night package, AMG Panamericana grille, AMG Spoiler lip, AMG Performance exhaust system. Under the car, you get the additional AMG Electronic rear-axle limited-slip differential, AMG Sports suspension based on AIR BODY CONTROL, • AMG High-performance composite braking system, AMG Performance 4MATIC+ With fully variable torque distribution and AMG SPEEDSHIFT MCT 9-speed sports transmission with RACE START function. Thankfully the GLC was in my mind a proper SUV, none of this 4-door coupe business. I am sure some people like them, but they are not my cup of tea at all. I just can’t see why you would take a practical shaped SUV and then put a fastback slope on it. Anyway, less about that and more about the car I was collecting. If you didn’t know much about the GLC 63 AMG S you could easily have overlooked it in black. In this colour the big intakes, body kit and arches were not as loud as white. It still had a muscular strong stance, while having a nice sleeper quality to it. I think it looked great, not sure I would have picked black, but it still looked pretty damn good to me. 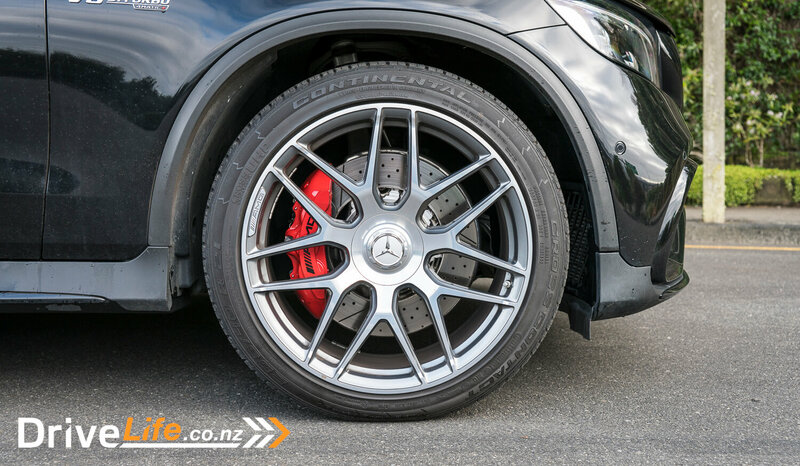 The 21-inch alloy wheels popped against the black body and red AMG calipers were a great touch. For those who knew what to look for, they would be able to tell that this is not a typical family SUV. Once in, it was clear that the GLC 63 AMG S was a luxury model. It has the right look and feel, with no surface or detail being overlooked. The interior trim was my own personal favourite; black ash open-pore wood. This trim has a very nice rich feel to it, soft touch, but it feels handcrafted in some way. The carbon fibre option felt a bit too plastic for this kind of vehicle, not as elegant. I suggest the open pore wood over the piano black option, as it’s very easy to get the piano black one dirty and covered in fingerprints. If you like to keep the inside of your vehicle clean like I do, then this is something to consider. . 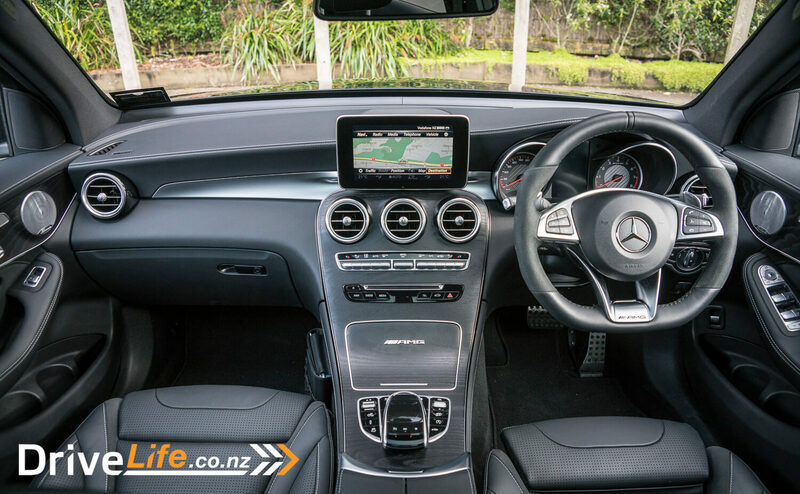 The AMG sport seats were great – very comfy and supportive. They have endless ways to adjust until you find the right spot that worked for you. I have never been a fan of the Mercedes seat controls on the doors, as I feel you just set these and never need them again, so why not hide them away like everyone else. The steering wheel was flat bottomed with alcantara side grips, which I really loved, giving it a very sporty and luxurious feel. 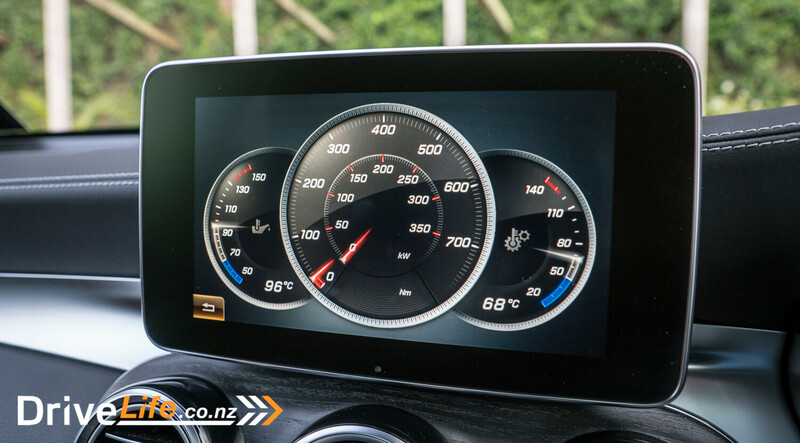 The paddles on the 43 AMG Coupe felt a bit pointless, however this was not the case for the AMG 63 S. Even though it had the same number of gears (9), I found that I used the paddles a lot more than I expected. It didn’t hurt that this generated a lovely sound from the engine and exhaust on each downshift, which was intoxicating. The dials behind the wheel where simple but exactly what you needed. I like how sunken they were into the dash and it felt more sporty due to the checker pattern inlay. It displayed speed on one side and rpm on the other. The small central digital screen showed a selection of info that could be customised. My old nemesis: the COMAND media screen, still looks like it’s stuck on with velcro. Mercedes, please blend this in, everyone hates it, and it’s the only thing in the cabin that feels cheap. Can’t wait to see the dual displays from the S and E class make it way into the GLC. It would complete the luxury package they currently offer in the GLC SUV. On the flip side the COMAND media system is well laid out and easy to navigate with the touch pad and rotation control wheel in the centre console. There are many menus available, from your standard media options like radio or MP3, performance customisation to the array of colour available for the LED interior lighting. There was a fun display screen in the performance menu which showed you a selection of dials. This shows 3 dials, one for oil temperature, one for coolant temperature and a central one that shows the real time usage of torque and kW. I am going to be fooling no one in saying that I did not try to see how high I could get the dial. To my surprise, if you floor it from standstill, you get easily get the top torque figure of 700Nm. The back seats had a lot of space and I was glad that I could get in and sit comfortably even behind my own tall driver’s seat position. My 9-month old daughter loved the rear space and the panoramic glass roof, where she could look up at the buildings as we travelled through the city. 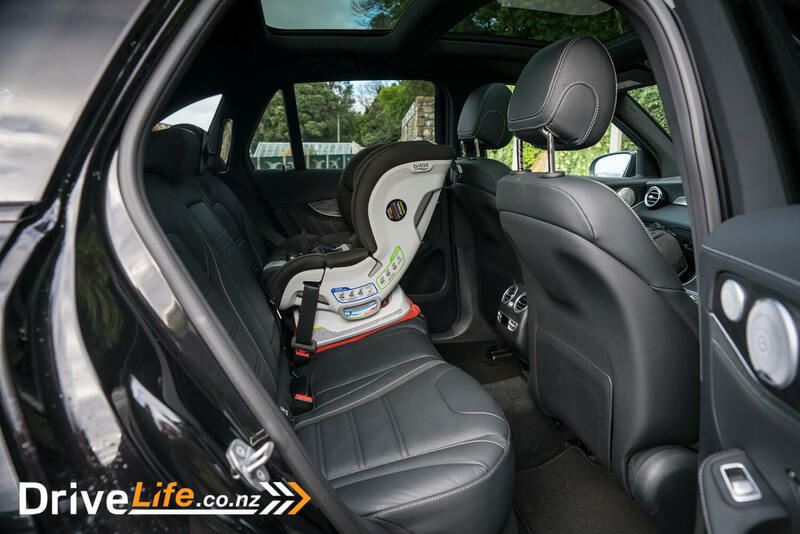 I was a bit surprised to see that our baby seat did not fit in the back without having the front passenger seat really far forward. It is a big baby seat, but it’s not the biggest we found when shopping for them. Something to keep in mind as It’s only due to the fact the seat has to be rear facing for her age. The boot is a good space, and deep. When out on a family day in Wellington, the boot handled our daughter’s buggy and additional bags without any struggle. There was even room for additional shopping if required. This was good too see as buggies these days are massive. 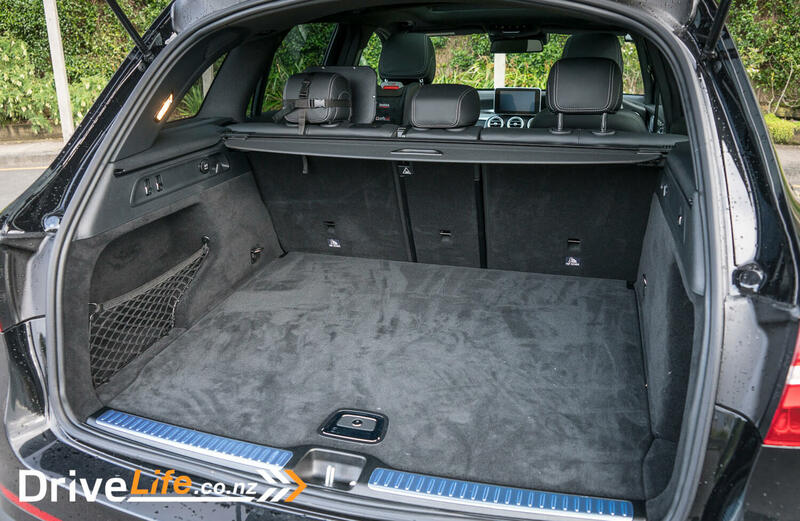 There were additional buttons in the boot, one when pressed, lowered the rear of the vehicle, making it easier to lift items in and out of the back. The other two triggered the electric folding rear seats, that could be triggered from the rear in case you required additional storage space instantly. The minute you start up the GLC 63 AMG S, you know this is won’t be a Driving Miss Daisy experience. 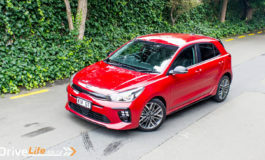 With a press of the button – thanks to keyless entry and keyless push-button start – the mighty V8 engine roars into life with a short rev of the engine and grumble of the exhaust. This is not going to be a boring review at all. Before we go into much more detail, I will cover the driving modes. There are 4 available: Standard, Sport, Sport+ and Race. I respect that Mercedes-Benz has not tried to insult the driver by offering an Eco mode in this beast. I can only describe the 4 drive modes available as the schizophrenic characteristics of the GLC. Sport and Sport + are best described as two levels of aggression. If you wanted a bit more instant power and a nice livable grumble from the exhaust you chose Sport. If you wanted a lot more instant power, some really loud noise and stiffer suspension then Sport+ is for you. Race is where you set everything to 11: engine, gears, suspension, exhaust. It’s the maddest of modes, one I found to be far too much for daily driving. In this mode, you could also select to go from all-wheel drive to rear-wheel drive thanks to the 4matic+ system. I know why you would want to do this, but for such a big SUV, you would need to know what you’re doing before selecting that option. You can only be impressed with the mighty V8 in the GLC. Its a 4.0 litre bi-turbo V8 that produces 375 kW and 700Nm of torque. Yes, 700Nm from a family SUV, that’s crazy. It’s the right sort of crazy for me, as this engine can propel the GLC to 100km/h in just 3.8 seconds. It’s eye-wateringly fast for a SUV, leaving you wondering if gravity even affects this machine. 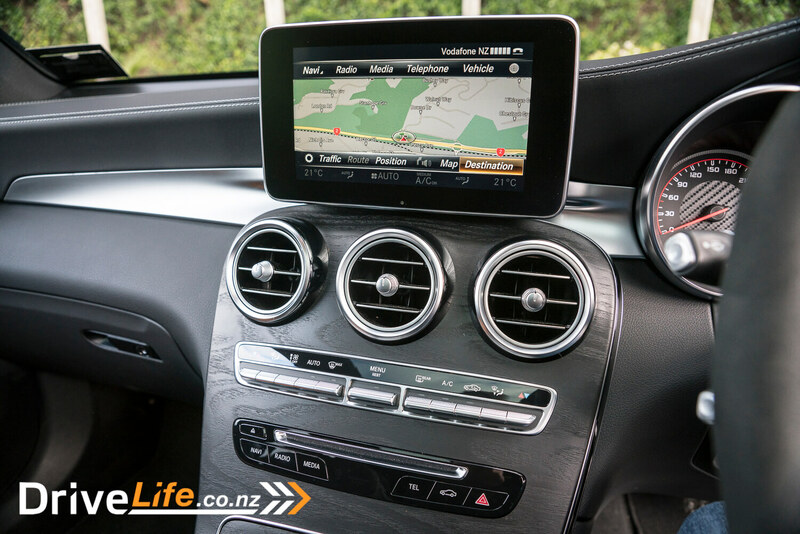 Driving the GLC 63 AMG S was rather invigorating – even in the standard mode, it made the most boring of journeys exciting. More often than not, I found myself in Sport or Sport+ mode due to the additional sound from the engine and exhaust. It was like a drug, the more I used it, the more I wanted it. The bark and grumble from the GLC was so head turning, that in many occasions it was louder and more aggressive than many boy racer cars. It did not have that tinny noise, it was loud grunty and powerful. 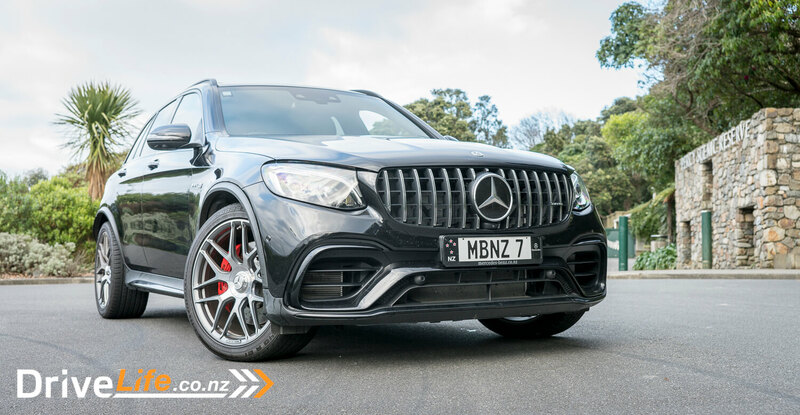 Any boy racer that was unfortunate to cross paths with the GLC 63 AMG S was first surprised and then impressed, with several thumbs up as I drove around or through some of the tunnels in Wellington. The only downside to this SUV was that the sound was heavily linked to the speed. 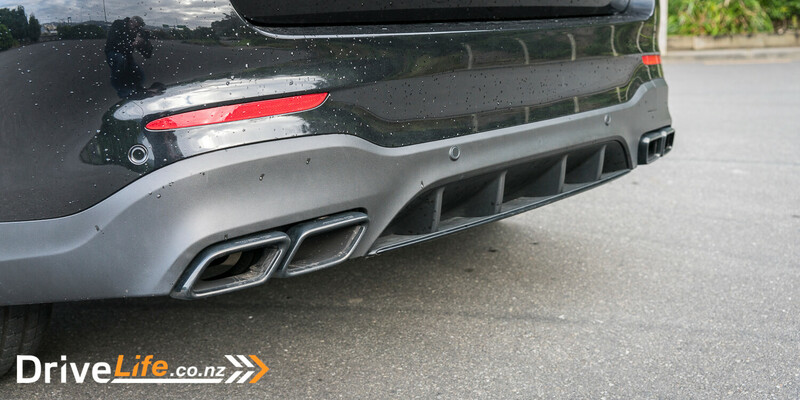 The more sound you wanted, the faster the SUV propelled itself forward. It was so powerful that you needed to keep a close eye on the speed at all times. 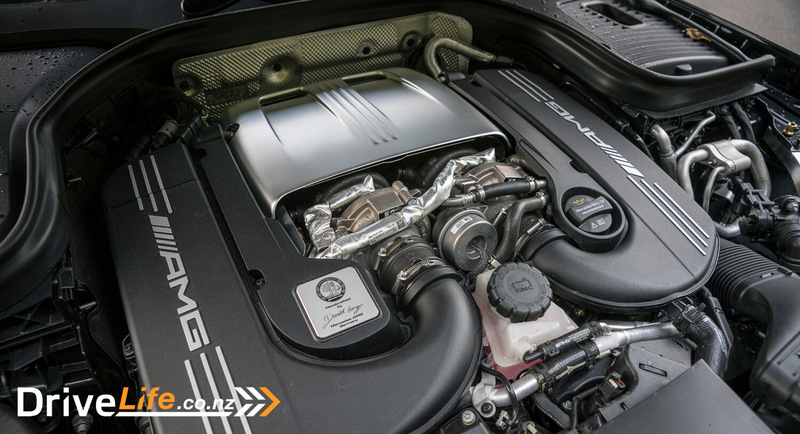 Thankfully I daily drive a twin-turbo v10 Audi RS6, I am used to excessively powerful engines. I was somewhat disappointed that I never got a chance to test the Race setting in a proper race track environment. I can only imagine that it would be amazing if the handling, sounds and performance from the Sport + mode was anything to go by, Race would be exceptional: maybe one day our paths will cross again, on an empty track. I know I have a better chance at winning the lotto, but if that happens i will buy one and hire a track. There was one issue that was not yet resolved from the 43 AMG. On full lock of the steering wheel, the huge 21” wheels skipped when first moving off. It’s a little bit annoying, but once you know it’s due to full lock of the steering wheel I just avoided turning it that far. I am not sure that I can convey how much fun I had driving this SUV. Even in traffic, or just going with the flow of other drivers, it made the simple experience of driving somehow special, Which is exactly what an AMG should do. It’s king of the hill when it comes to the competition. It’s all about who can provide the most excessive and somewhat insane product available. 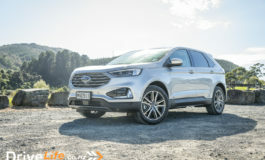 As mentioned before, it’s more about the want rather than a need, but it’s cool to see manufacturers still pushing the boundaries now with SUV’s as they did some years ago with sedans and wagon. What makes an AMG an AMG? It’s usually 3 things,: barking mad power, face-melting speed and crotch-wetting sound. These to me are the basic ingredients in making the perfect AMG. 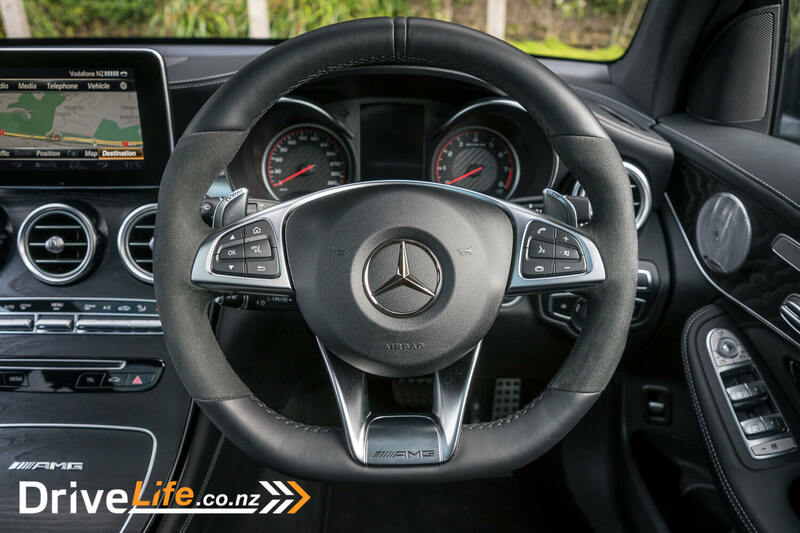 Does the GLC 63 AMG S ticks all the boxes? Barking mad power, oh yes, check. Face-melting speed, another big yes, check. And last but definitely not least, crotch-wetting sound, oh my god yes, double check. This GLC has it all when it comes to bonkers performance. I want one, simple as that. It’s a big practical family SUV that sounds like its powered by dark magic and has the performance figures most 911 Porsches gloat about. It’s not cheap, nor is it economical, but it’s not trying to achieve credit here either. It’s a super desirable want, that all of us probably would never really need. This vehicle is everything that an AMG should be – good looking, a bit of a sleeper, extremely mad, great performance, amazing sound, and the height of luxury. The sound experience pushes the GLC over the BMW X5 M as the best performance SUV I had driven to date, and I think it’s a rather hard one to beat.